In the Falaise Packet during the Battle For France, retreating Germans were decimated by Polish and Canadian forces. 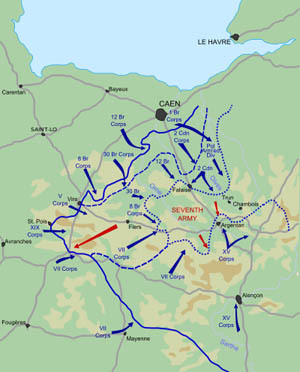 While the 30th Infantry Division was fighting for its life at Mortain, a plan was devised to cut off the retreating German Army in an area known as the Falaise Pocket. The “upper jaw” of this encirclement comprised the Canadian Army, the British Army, and elements of the U.S. First Army and the Polish Army. The “lower jaw” consisted of the U.S. First Army’s VII Corps and the U.S. Third Army’s XV Corps. An estimated 300,000 German soldiers were trapped in the pocket. The once proud Panzer divisions had less than a hundred tanks among them. Still, the enemy was a formidable foe and was not about to give in so easily. With Operation Luttich failing miserably, it was imperative that the town of Falaise be taken to close the gap on the retreating enemy. On August 14, Canadian General Guy Simond initiated Operation Tractable, which called for a daylight assault camouflaged by a smokescreen for the rapidly advancing armored groups. Unfortunately, Allied bombers mistakenly hit the Canadian and Polish troops attempting to jump off for the attack, inflicting 400 casualties. Several days later, the 2nd Canadian Infantry Division was ordered to seize Falaise. As the town finally fell, the 4th Canadian and 1st Polish Armored Divisions raced to sever the German retreat east of the village. The Poles took up positions on a wooded hill dubbed Maczuga or Mace. Soon the Polish troops were heavily engaged with SS units hammering their defenses. Despite being low on ammunition and other supplies, they held their ground. Finally, after several days of intense combat, they were relieved by the Canadian Grenadier Guards. Sadly, the Poles paid dearly for stopping the German withdrawal. They had lost a total of 2,300 men. To the west, other Canadian units were having a hard time as well. The South Alberta Regiment, an armored unit, reinforced with infantry from the Argyll and Sutherland Highlanders, fought a pitched battle with enemy forces at a key intersection in the town of St. Lambert. Cut off from other units, the Canadians put up a dogged defense. Major David Currie, commanding officer of Squadron C of the South Alberta Regiment, stood tall during the engagement. Currie sped along the line yelling encouragement to his troops. The intrepid officer knocked out a massive Tiger tank alone. The unit was in combat for over 24 straight hours, and when it was over the Canadians had killed or wounded over 300 German soldiers and captured another 2,100. For his extraordinary bravery under fire, Currie was presented with the Victoria Cross, the highest decoration of the British Commonwealth. On August 20 the Falaise Pocket was finally sealed off. Ten thousand German soldiers were killed, and 50,000 were captured. Unfortunately, nearly 40,000 managed to escape. Although some historians have criticized Allied leaders, including XII Army Group Commander General Omar Bradley, for moving too slowly, the damage inflicted on the Germans at Falaise was serious. Tags Falaise Pocket, General Omar Bradley, Tiger Tank.